Ukrainian security forces killed three pro-Russian activists, wounded 13 and took 63 captive in a firefight overnight in the eastern city of Mariupol, the interim Ukrainian interior minister said on Thursday. The clash was the most lethal so far in the east of the country. The minister, Arsen Avakov, said the protesters had tried to storm a base used by troops in the newly formed National Guard, which has drawn from volunteers who took part in last winter’s protest movement against the government. A crowd made up of civilians as well as militants formed outside the base, he said. Mr. Avakov’s description of the conflict indicated another challenge for the new government, as in other cases where pro-Russian groups have seized administrative buildings and police stations. The events in Mariupol overnight, and in the towns of Slovyansk and Kramatorsk, north of the provincial capital of Donetsk, on Wednesday, underscored both the limits of Ukraine’s military and the difficulties of the tactical problems it faces in its attempt to dislodge armed separatists from eastern Ukraine. In a glaring humiliation for the government, a military operation to confront pro-Russian militants in the east unraveled on Wednesday with the entire contingent of 21 armored vehicles that had separated into two columns surrendering or pulling back. The separatists are well armed and have been accompanied by bold local supporters, including unarmed civilians and elderly women, who mingle in front of and among the armed men. Driving off the separatists in such a mixed crowd, or even trying to arrest them, would be a difficult task even for a well-disciplined force with high morale. It would risk endangering civilians, potentially leading to bloodshed that might provoke a Russian military reaction. The eastern protesters are also accompanied by far more heavily armed groups, which Western governments say include Russian soldiers or soldiers equipped by Russia. In the Kiev protests that ousted former President Viktor F. Yanukovych, firearms appeared only in the final days of protests, and then only pistols and shotguns, though protesters said they possessed seized military weapons that were never brandished. 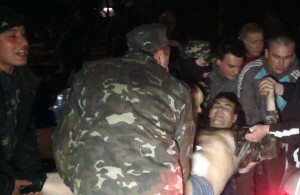 In Mariupol, the attackers threw Molotov cocktails and opened fire on the perimeter guards at the base, Mr. Avakov said. About 300 people were in the crowd. “After warnings, in accordance with our rules, and after repeat attacks, we opened lethal fire,” Mr. Avakov said in a statement. The operation that the government said would confront pro-Russian militants in the east unraveled Wednesday with the entire contingent of 21 armored vehicles surrendering or retreating. Though gunshots were fired throughout the day and continued sporadically through the evening in Slovyansk, a town about 120 miles from the Russian border that is occupied by pro-Russian militants, it was unclear whether anybody had been wounded. One of the armored columns stopped when a crowd of people, many of whom were drinking or yelling taunts, gathered on the road before them. Later in the day its commander agreed to hand over the soldiers’ assault rifles to the very separatists they were sent to fight. Another column from the same unit, the 25th Dnipropetrovsk paratrooper brigade, surrendered not only its weapons but also the tracked and armored vehicles it had arrived in, letting militants park them as trophies, under a Russian flag, in a central square. A pro-Russian militant climbed into the driver’s seat of one of the vehicles and spun it around on its tracks, screeching and roaring, to please the watching crowd. The events on Wednesday underscored the weakness of the new Ukrainian government as it begins critical talks about the country’s future with the United States, Russia and the European Union in Geneva on Thursday. Officials unable to exercise authority over their own military seem increasingly powerless to contain a growing rebellion by pro-Russian militants. The Ukrainian soldiers on Wednesday had no accompanying force to control the crowds that formed around their advancing units. Their task, to confront armed militants intermingled with civilians, would be extremely difficult for any conventional army, but for this group, which apparently lacked the tools and the heart to carry it out, it proved to be impossible. The Ukrainian contingent that surrendered handed over their vehicles to men in unmarked green uniforms, who made their presence more public on Wednesday than it had been earlier. They drove them to the central plaza of Slovyansk and parked them there for all to see, the flags of Russia and the newly declared and wholly unrecognized People’s Republic of Donetsk flapping above them in the breeze. In Kiev, the Defense Ministry initially denied that the armored vehicles had been captured. Then Sergei Sobolev, the acting head of the Fatherland party in Parliament, claimed that the armored vehicles had flown Russian flags as part of an ingenious subterfuge to get through pro-Russian crowds. A Russian website, Regnum, citing an unnamed source identified as a Polish diplomat, reported that the deposed president, Mr. Yanukovych, intended to travel to eastern Ukraine over the weekend. Mr. Yanukovych has been living in Russia.